Adoption is something that is very near and dear to my heart. I was given up for adoption right at birth, so I have never known anything else other than my family I have now. And if you are waiting for me to refer to my family as my Adopted Family, you will not read it here. My Mom and Dad ARE my Mom and Dad. No other labels are needed. My Sister and Brother ARE my Sister and Brother. Again no other labels are needed. It takes so much more than blood to make a family, and my family has proved that. I don’t remember ever being told I was adopted, it was just something I grew up knowing. There was no turning point in my life that things suddenly felt different for me because I found out. It has always been apart of me. I am so thankful I have a family that has always been so open to talking about it. Always there to answer any questions. There to hold me if my emotions got to be too much and I had a cry over it. I knew it was always safe to ask questions about my Birth Mom. I grew up knowing that my Birth Mother loved me very much and did what was best for me. She wanted a life for me that she herself could not give me at the time. I love her so much for what she did for me. It was the most selfless thing ever. I love my Birth Mother so much, but I understand why she did what she did, and I am thankful she did. I would love to know her, to meet her, to finally be able to give her a hug, to let her know I love her, to let her know I understand why, and to thank her. I grew up with such am amazing family. My parents are the best. I got to grow up in Kenya, I got to meet some amazing people, do some pretty awesome things so far in my life, and I got to meet my husband and have our children. All because my Birth Mother loved me more than herself and wanted more for me. Thank you. And thank you to my Mom and Dad. It is such an amazing thing for you guys to take in a baby that is not biologically yours and still love me so fiercely that made our mis-match of DNA a moot point. Not only did you open your hearts up to one child, but three. Thank you for building such an amazing family. Thank you for having such big, loving, gracious hearts. 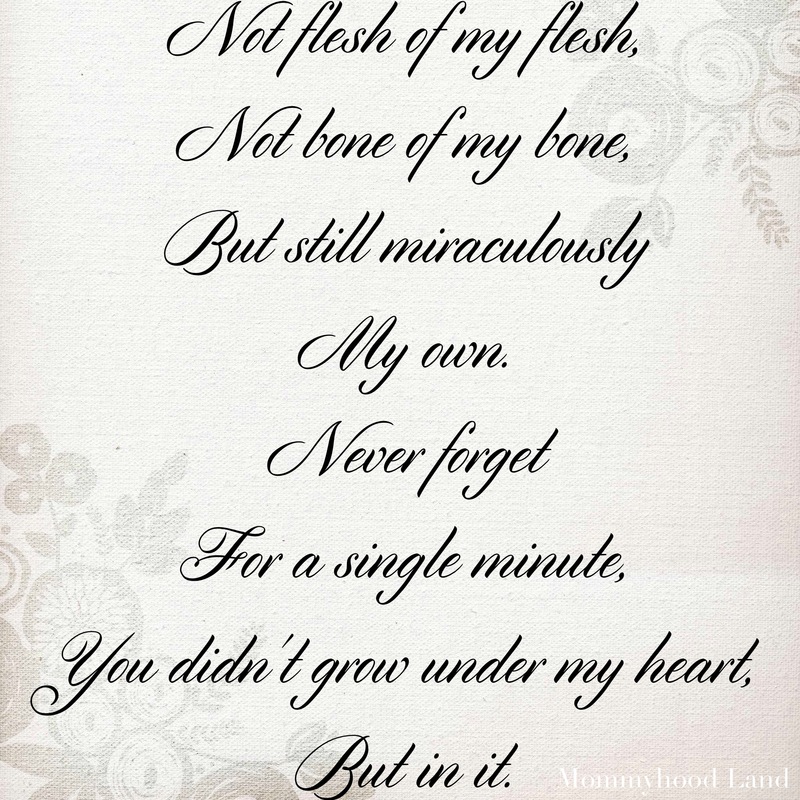 Mom, you didn’t birth me, but you were always meant to be my Mom. I can not thank my Birth Mother, Mom and Dad enough for all coming together to give me such an amazing life and to love me so fiercely. If you, or someone you know has been touched about Adoption, I would love to hear your story!